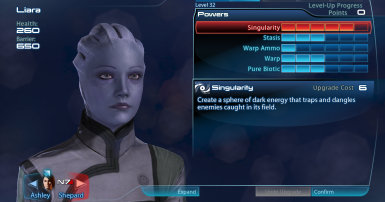 This mod changes Liara's facial texture, default outfit, and eye color to be more in line with the appearance she had in Mass Effect 1 and 2. Used anotheraza's ME3 Unique NPC Colour Data to help me find the color files to modify. Do you like continuity? 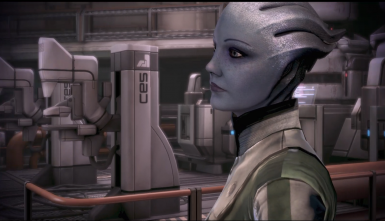 Were you blindsided by Liara's highlighter blue eyes? Are you not a fan of the giant white crotch arrow in her new outfit? Do we have massive uptightness about appearance continuity in common? Then this is the mod for you! 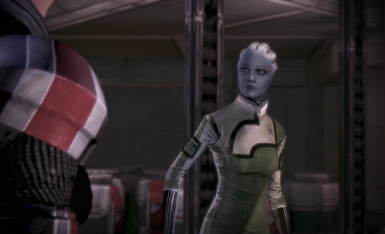 This mod reverts Liara's eyes to their previous gray-blue color, changes her facial texture to look more like the one from ME2, and changes her white outfit to the green and white science uniform she wore on the Normandy SR-1. It affects five texture files, and meshes and hex values in the following PCC files: BioA_CitSam_000LevelTrans, BioH_Liara_00, BioH_Liara_00_Explore, BioH_Liara_00_NC, BioA_Cit003_000LevelTrans, and BioH_Liara_CitSim. It affects only hex values in BioH_Liara_01 and BioH_Liara_01_Explore. I would recommend backing up those files, but hey. I'm not your mother. The main package contains two .mod files, one for the base game and one for Citadel DLC. It also contains one .tpf file that contains all the textures. I've also uploaded the unpacked .pcc and texture files for those of you who prefer to install that way. Open ModMaker (red icon on the default screen when it starts up), click the load button in the upper left hand corner, navigate to wherever you put the files, and open the .mod files. Hit run all. Open TPFTools (green icon on the default screen when it starts up), click the load button in the upper left hand corner, navigate to wherever you put the files, and open the .tpf file. Hit install valid in the bottom left corner.